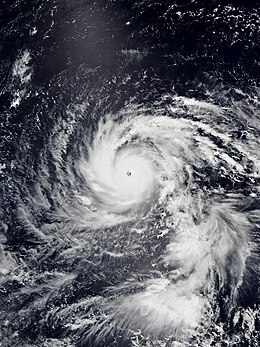 Typhoon Jebi, known in the Philippines as Typhoon Maymay, was considered to be the strongest typhoon to strike Japan since Typhoon Yancy in 1993. Jebi formed as a tropical depression on August 26, before becoming the twenty-first named storm of the 2018 Pacific typhoon season on August 28. It rapidly intensified into a typhoon on the following day and reached its peak intensity on August 31, after striking the Northern Mariana Islands. Jebi initiated a slow weakening trend on September 2 and made landfall over Shikoku, and then the Kansai region of Japan, as a very strong typhoon on September 4. A low-pressure area formed near the Marshall Islands early on August 25. It remained devoid of a low-level circulation center (LLCC) next day; however, the system developed further on August 27 and both the Japan Meteorological Agency (JMA) and the Joint Typhoon Warning Center upgraded it to a tropical depression, based on persistent deep convection wrapping into a consolidating LLCC. Early on August 28, the system was upgraded to a tropical storm, with JMA assigning the storm the international name Jebi. On the August 29, the JMA upgraded the storm to a typhoon, after it developed an eye with a central dense overcast, and underwent rapid intensification. Jebi continued to intensify, becoming the third super typhoon of the season and also the second Category 5-equivalent super typhoon of the season. On September 4, Jebi made its first landfall over the southern part of Tokushima Prefecture at around 12:00 JST (03:00 UTC). Afterward, Jebi crossed Osaka Bay and made its second landfall over Kobe, Hyōgo Prefecture at around 14:00 JST (05:00 UTC), and then moved over Osaka and Kyoto prefectures, before ultimately emerging into the Sea of Japan shortly after 15:00 JST (06:00 UTC). Simultaneously, a cold front formed southwest of the typhoon, indicating the beginning of an extratropical transition. On September 5, after JTWC issued a final warning at 00:00 JST (15:00 UTC), Jebi was downgraded to a severe tropical storm at 03:00 JST (18:00 UTC), when it was located near the Shakotan Peninsula of Hokkaido. The storm completely transitioned into a tropical storm-force extratropical cyclone off the coast of Primorsky Krai, Russia, shortly before 10:00 VLAT (09:00 JST, 00:00 UTC). Later, the extratropical cyclone moved inland. The terrain of Khabarovsk Krai contributed to the steadily weakening of the storm as the it moved inland northwestward and then turned northward; Jebi's extratropical low passed northeast of Ayan early on September 7. Jebi's extratropical remnant continued northward, and then turned northeastward, before dissipating on early September 9 over the Arctic Ocean. Typhoon Jebi brought large waves to the east coast of Taiwan on September 2 and 3 when it recurved northward east of the Ryukyu Islands. On September 2, at the Mystery Beach in Nan'ao Township, Yilan County, deadly incidents involving large waves were reported on September 2, causing 5 fatalities; the other one death also occurred at the Neipi Beach in Su'ao Township. In the next morning, also at the Neipi Beach, a middle-aged woman was also swept away by the waves; however, it was reported that she walked into the waves and stayed in the ocean, presumed to be a suicidal action. Typhoon Jebi was the most intense tropical cyclone to make landfall over Japan since Typhoon Yancy in 1993, causing a significant disaster in the Kansai region. At least 11 deaths and more than 600 injuries were reported across the region. Kansai International Airport, one of the most important transport hubs in Japan, was completely shut down because of flooding. A fuel tanker rammed into Sky Gate Bridge R and severely damaged it, cutting off the linking road to the airport and leaving more than 3,000 travelers and employees stranded. The typhoon broke the historical records of 10-minute maximum sustained winds at 53 weather stations and the maximum gust at 100 weather stations in Japan, mostly on September 4. The highest sustained winds from Jebi were recorded at Cape Muroto, of 48.2 m/s (174 km/h), although the maximum gust of 55.3 m/s (199 km/h) was ranked third. At Kankujima (the island of Kansai International Airport), the maximum sustained winds of 46.5 m/s (167 km/h) were ranked second and the maximum gust of 58.1 m/s (209 km/h) was ranked first, significantly higher than the previous records (from Typhoon Cimaron, only 12 days earlier) for the airport. At the downtown of Wakayama, the maximum sustained winds of 39.7 m/s (143 km/h) and the maximum gust of 57.4 m/s (207 km/h) were also recorded. Even at Chūō-ku, the financial center of Osaka, the exceptional maximum gust of 47.4 m/s (171 km/h) was recorded. Jebi also produced a maximum storm surge of 3.29 m (10.8 ft) in Osaka, surpassing the previous record of 2.93 m (9.6 ft) from the 2nd Muroto Typhoon (Typhoon Nancy) in 1961. Agricultural damage were about ¥44.22 billion (US$397 million), and estimates of insured loss ranged from US$3–5.5 billion (¥340–620 billion). ^ McCurry, Justin (September 4, 2018). "Typhoon Jebi: Japan hit by strongest storm of 25 years". The Guardian. Retrieved September 4, 2018. ^ "250600UTC AUG. 2018 Surface Analysis". Japan Meteorological Agency. August 25, 2018. Archived from the original (PDF) on September 4, 2018. Retrieved September 4, 2018. ^ "Significant Tropical Weather Advisory for the Western and South Pacific Oceans 260600Z-270600ZAug2018". Joint Typhoon Warning Center. August 26, 2018. Archived from the original on August 26, 2018. Retrieved September 4, 2018. ^ "WWJP25 RJTD 270000". Japan Meteorological Agency. August 27, 2018. Archived from the original on August 27, 2018. Retrieved September 4, 2018. ^ "Prognostic Reasoning for Tropical Depression 25W (Twentyfive) Warning Nr 01". Joint Typhoon Warning Center. August 27, 2018. Archived from the original on August 27, 2018. Retrieved September 4, 2018. ^ 平成３０年　台風第２１号に関する情報　第５２号 (in Japanese). Japan Meteorological Agency. September 4, 2018. Archived from the original on September 4, 2018. Retrieved September 4, 2018. ^ 平成３０年　台風第２１号に関する情報　第５５号 (in Japanese). Japan Meteorological Agency. September 4, 2018. Archived from the original on September 4, 2018. Retrieved September 4, 2018. ^ Kitamoto, Asanobu. "Typhoon 201821 (JEBI) - Detailed Track Information". Digital Typhoon. National Institute of Informatics. Retrieved September 4, 2018. ^ "WWJP25 RJTD 040600". Japan Meteorological Agency. September 4, 2018. Archived from the original on September 6, 2018. Retrieved September 6, 2018. COLD FRONT FROM 32N 130E TO 29N 127E 27N 124E. ^ "Tropical Storm 25W (Jebi) Warning Nr 034". Joint Typhoon Warning Center. September 4, 2018. Archived from the original on September 4, 2018. Retrieved September 6, 2018. ^ "WWJP25 RJTD 050000". Japan Meteorological Agency. September 5, 2018. Archived from the original on September 5, 2018. Retrieved September 6, 2018. ^ "WWJP25 RJTD 050600". Japan Meteorological Agency. September 5, 2018. Archived from the original on September 5, 2018. Retrieved September 9, 2018. ^ "070000UTC SEP. 2018 Surface Analysis" (PDF). Japan Meteorological Agency. September 7, 2018. Archived from the original (PDF) on September 9, 2018. Retrieved September 9, 2018. ^ "070600UTC SEP. 2018 Surface Analysis" (PDF). Japan Meteorological Agency. September 7, 2018. Archived from the original (PDF) on September 9, 2018. Retrieved September 9, 2018. ^ Shen, Rufeng (沈如峰) (September 5, 2018). 宜蘭海上發現浮屍 證實為神秘沙灘失蹤者 (in Chinese). Yilan County, Taiwan: Central News Agency. Archived from the original on September 5, 2018. Retrieved September 4, 2018. ^ Keoni, Everington (September 4, 2018). "Rogue waves claim 6 lives over 2 days in NE Taiwan". Taiwan News. Archived from the original on September 4, 2018. Retrieved September 4, 2018. ^ Shen, Rufeng (沈如峰) (September 3, 2018). 南澳神秘沙灘落海意外已釀4死 尚有1失蹤 (in Chinese). Yilan County, Taiwan: Central News Agency. Archived from the original on September 4, 2018. Retrieved September 4, 2018. ^ "Japan deals with Jebi aftermath". NHK. September 5, 2018. Retrieved September 5, 2018. ^ 特定期間の観測史上1位の値 更新状況（2018年 9月 3日～2018年 9月 5日） (in Japanese). Japan Meteorological Agency. September 6, 2018. Archived from the original on September 9, 2018. Retrieved September 9, 2018. ^ 特定期間の全国観測値ランキング（2018年 9月 3日～2018年 9月 5日） (in Japanese). Japan Meteorological Agency. September 6, 2018. Archived from the original on September 9, 2018. Retrieved September 9, 2018. ^ 平成 30 年台風第 21 号による高潮 (PDF) (in Japanese). Japan Meteorological Agency. September 5, 2018. Archived from the original (PDF) on September 9, 2018. Retrieved September 9, 2018. ^ 平成30年台風第21号による被害状況 (in Japanese). Ministry of Agriculture, Forestry and Fisheries. December 7, 2018. Retrieved December 8, 2018. ^ "RMS Estimates Insured Losses from Typhoon Jebi Could Reach $5.5 Billion". Insurance Journal. September 14, 2018. Retrieved September 17, 2018. Wikimedia Commons has media related to Typhoon Jebi (2018). This page was last edited on 12 April 2019, at 11:40 (UTC).